This delicious beer bread recipe is sure to be a big talking point at your next dinner party. Something so novel but so tasty will surprise and impress all your guests. 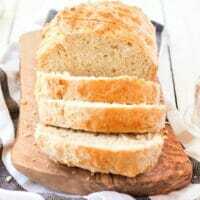 Beer bread recipe is super easy to make compared to any other bread recipe. You’ll have people fooled thinking you’ve spent hours kneading dough to make this beer bread recipe from scratch. If you’re cooking with beer, you might as well give this Beer Marinated Chicken recipe a try? You’ll be surprised at how delicious it is. If you want another great quick bread recipe, check out our pumpkin banana bread recipe. Beer bread is a simple quick bread, also known as a yeast bread, flavored with beer. Beer and bread are created in a very similar way. Yeast is used to turn sugars into both carbon dioxide and alcohol but a large portion of the alcohol evaporates during the baking process for bread. 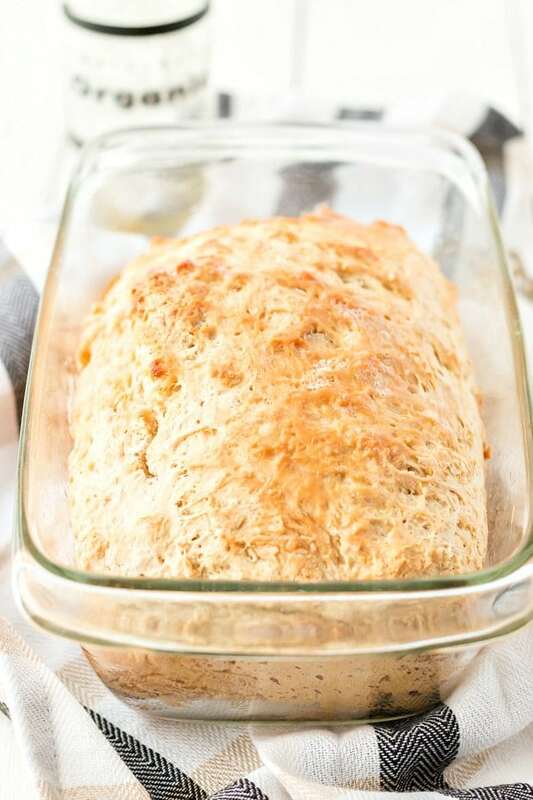 This simple homemade beer bread recipe is perfect when you need a tasty loaf in a hurry. Baking bread doesn’t get much easier than this because there’s no kneading, no messing around with yeast and best of all, no rising time. Because you get to use beer in this recipe smells the bread smells amazing and unlike any other loaf. 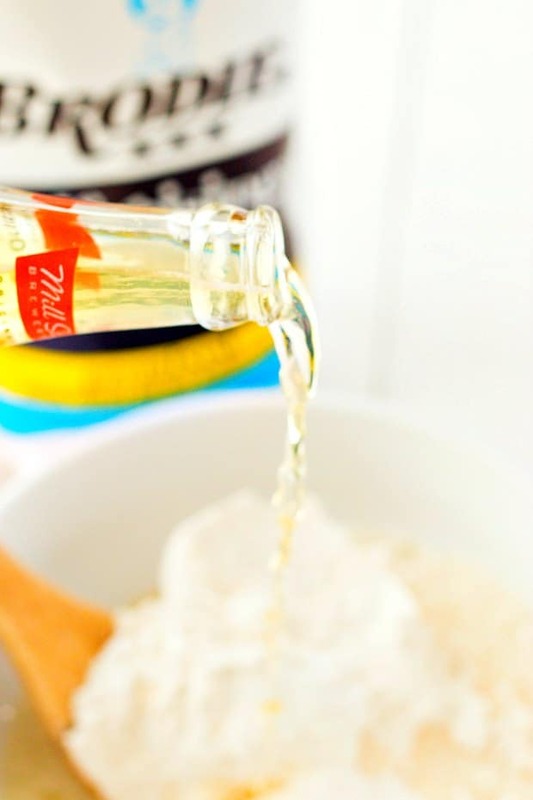 Even if you’re not a fan of beer, you’re going to love this beer bread recipe. Beer bread is great for both your breakfast toast or a lunchtime sandwich. Many quick breads get their rising action from baking powder or self raising flour, not yeast and that’s exactly how this beer bread recipe works. Beer might be made with yeast but most commercial beers don’t contain living yeast organisms, so it’s not yeast from the beer that makes this beer bread rise. The beer is simply there to provide carbonation which helps to make the bread super fluffy and adds a sweet flavor. The beer you use in your beer bread recipe will make a difference to the loaf. A light-bodied beer will make a bread with a lighter flavor compared to a dark beer or stout. This homemade beer bread recipe will make one loaf but you could always double or triple it to make more. Because the beer you use in your beer bread recipe will have a significant effect on the loaf you make, you want to be sure you choose a suitable beer that matches your tastes. 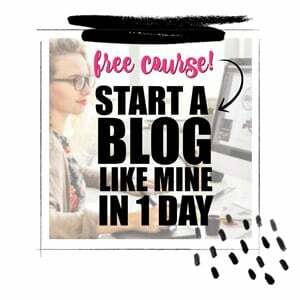 Or you could make one of each! How Do You Make Beer Bread? Mixing the ingredients for this beer bread recipe will take about 5 to 10 minutes and the baking time about one hour. In less than 1½ hours you could be eating warm, fresh beer bread. Preheat the oven to 350 degrees and place the bread pan in the oven to warm slightly. Mix the sugar, beer and self raising flour and place in the pan. Cook your beer bread recipe at 350 degrees for 50-60 minutes. Make sure that you stick a knife or skewer into the center of the loaf to check that it is cooked all the way through before you remove it from the oven. 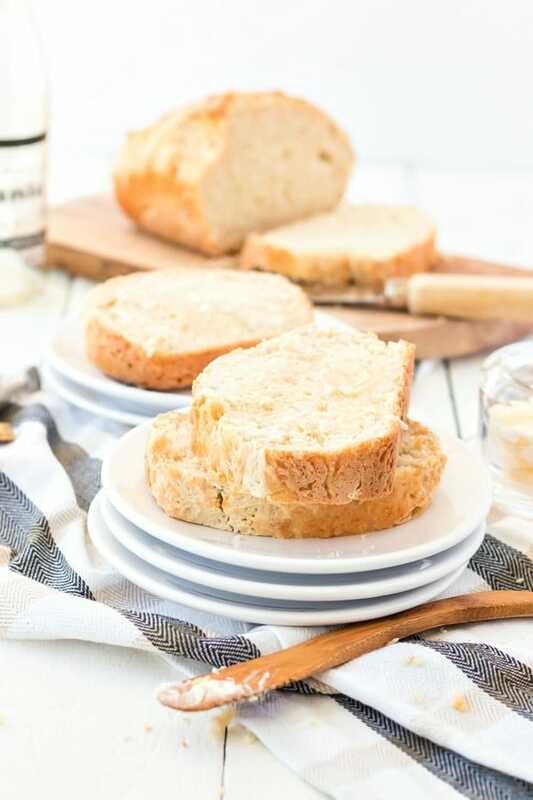 There are so many delicious things that you can serve with homemade beer bread! Soups and chili go particularly well with beer bread to help you mop up all the liquid. If you’re a meat lover and enjoy a good barbecue you should think about swapping cornbread for beer bread as an accompaniment for barbecued ribs or brisket. Any kind of dips and spreads go well with homemade beer bread. I particularly like hot buffalo chicken dip or spinach artichoke dip. To make this basic baked beer bread better, you could add cheddar cheese into the mix of serve it with cheese. Nothing is better than cheesy beer bread. If you love all things sweet and savory, you could add some basil, garlic or cheddar cheese to your beer bread batter. This recipe is also perfect for making beer bread muffins for smaller, individual portions or you could separate the dough into rolls that can be served fresh from the oven with some butter. Can You Freeze Beer Bread? You can keep your beer bread fresh for a few days when sealed in plastic wrap and stored at room temperature. Beer bread can be frozen if you want to keep it for longer and don’t intend to eat it right away. When you freeze beer bread, I recommend that you slice it first. Once you have cut the beer bread up, place baking paper between the slices so they don’t freeze together. The best way to freeze this loaf is to wrap it in plastic wrap and place in a plastic freezer bag to keep it extra fresh. 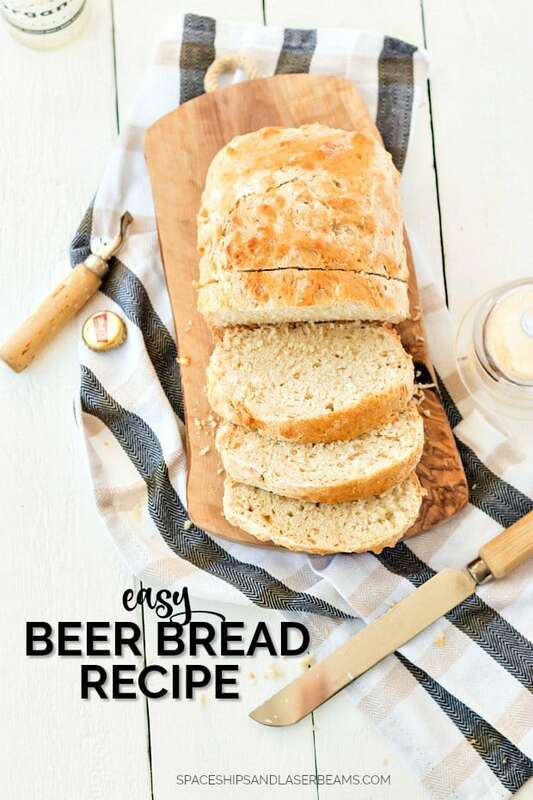 Get ready to WOW your guests whether they’re beer lovers or not – this beer bread recipe is going to be a huge hit. Easy and delicious, this beer bread recipe will become a favorite. Mix all ingredients and pour into a greased loaf pan. Bake for 50-60 minutes until a toothpick inserted the middle comes out clean. We love this recipe – it’s so easy and smells divine when baking! I could eat the whole loaf while it’s still warm, with butter!! I’ve made this bread many times. It really is delicious and really simple to make. I love bread and this looks amazing. Thanks for sharing at Merry Monday, see you next week! I live in Australia, our bottle sizes are different to the USA. Could you please clarify the size of the bottle of beer, how many mills or ounces?